The Brilliant Sean O'Meallie: How Does He Do It? 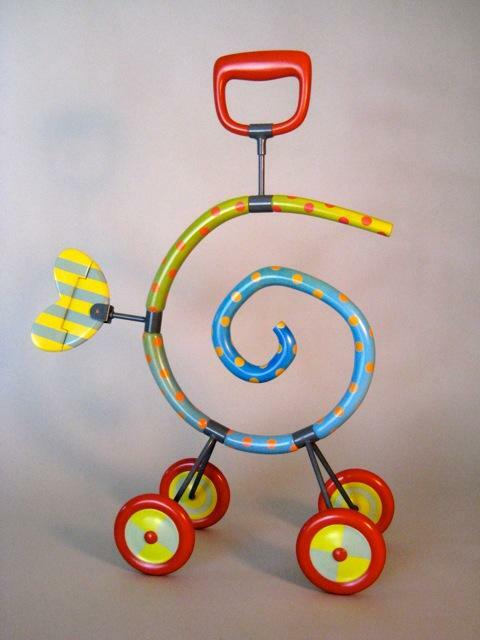 Lucky for those of you who plan to attend the Gallery of Contemporary Art's Brilliant Benefit on Saturday, August 10, local artist Sean O'Meallie has "Got A Handle On It: Circus", one of his deceptively whimsical sculptures, available for auction. You know how these things go: A piece worth $3-$4K could be yours for as little as... well, who knows? But it'll likely be quite a deal, particularly when you watch this slide show that shows that the art of making things look easy is indeed still difficult. This new artwork was created for the live auction at GOCA's Brilliant Party which will take place on August 10, 2013 at the university. 100% of the moneys raised from the sale will be used directly in GOCA's art programming for their campus and downtown galleries. There is no minimum or reserve price. I was not asked to donate. I volunteered this. I serve on their advisory board and I'm interested in supporting the wonderful and interesting cultural programming Daisy McConnell and her GoCA staff provide the region. This piece would retail in a gallery for $3000-$4000. This is the third version of this sculpture idea I've made in the last 18 years. The first is in a private collection in Los Angeles. The second was in a large and amazing private art collection which was entirely washed to sea by Hurricane Katrina in 2005. In this work the organic spiral form represents time and the attachments squeezed onto it are human devices of movement and control. It's colorful, because life feels like a circus lately. Get your tickets to GOCA's Brilliant HERE. This weekend, the local skateboarding non-profit SK8-Strong will host the Rocky Mountain State Games, an amateur contest at Memorial Park. They’ll host a professional contest at Memorial Park on the weekend of August 8. The Big Something’s Noel Black sat down and spoke with SK8-Strong’s founder, 16-year-old professional skateboarder Jono Schwan, and Rachel Reinhard, a local professional who recently competed in the X-Games in Brazil. Get all the details about this weekend's amateur contest and the August 8 - 10 Rampage over at Sk8-Strong. No, not Nick Cave and the Bad Seeds; the artist/performance art Nick Cave. If you haven't heard about his exhibition at the Denver Art Museum, we highly recommend it and managed to snap these photos of his new, decidedly silver-themed Soundsuits before the guard tsk tsked us.